Although clear sealers do not fit the definition of true waterproofing systems, they do add water repellency to substrates where solid coatings as an architectural finish are not acceptable (see Fig. 3.2.). Clear sealers are applied on masonry or concrete finishes when a repellent that does not change substrate aesthetics is required. Clear sealers are also specified for use on natural stone substrates such as limestone. Water repellents prevent chloride ion penetration into a substrate and prevent damage from the freeze–thaw cycles. FIGURE 3.2 Repellency of sealer application. There is some disagreement over the use of sealers in historic restoration. Some prefer stone and masonry envelope components to be left natural, repelling or absorbing water and aging naturally. This is more practical in older structures that have massive exterior wall substrates than in modern buildings. Today exterior envelopes are as thin as 1 8 inch, requiring additional protection such as clear sealers. The problem with clear sealers is not in deciding when they are necessary but in choosing a proper material for specific conditions. Clear repellents are available in a multitude of compositions, including penetrates and film-forming materials. They vary in percentage of solids content and are available in tint or stain bases to add uniformity to the substrate color. The multitude of materials available requires careful consideration of all available products to select the material appropriate for a particular situation. Repellents are available in the compositions and combinations shown in Table 3.2. Sealers are further classified into penetrating and film-forming sealers. Clear sealers will not bridge cracks in the substrate, and this presents a major disadvantage in using these materials as envelope components. Should cracks be properly pre- pared in a substrate before application, effective water repellency is achievable. However, should further cracking occur, due to continued movement, a substrate will lose its watertightness. Properly designed and installed crack-control procedures, such as control joints and expansion joints, alleviate cracking problems. 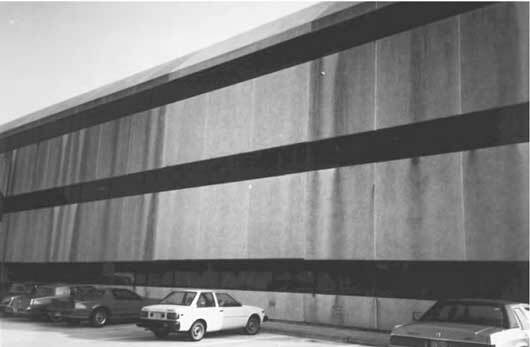 Figure 3.3 shows a precast cladding after rainfall with no sealer applied. Water infil- trating the precast can enter the envelope and bypass sealant joints into interior areas. Figure 3.4 demonstrates just how effective sealers can be in repelling water. 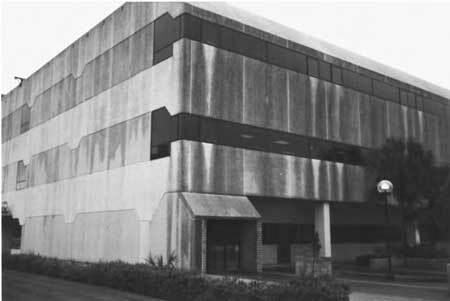 FIGURE 3.3 Precast concrete building with no sealer permits water absorption. FIGURE 3.4 Effectiveness of sealer application is evident after a rainfall. Film-forming, or surface, sealers have a viscosity sufficient to remain primarily on top of a substrate surface. Penetrating sealers have sufficiently low viscosity of the vehicle (binder and solvent) to penetrate into masonry substrate pores. The resin molecule sizes of a sealer determine the average depth of penetration into a substrate. Effectiveness of film-forming and penetrating sealers is based upon the percentage of solids in the material. High-solid acrylics will form better films on substrates by filling open pores and fissures and repelling a greater percentage of water. Higher-solids-content materials are necessary when used with very porous substrates; however, these materials may darken or impart a glossy, high sheen appearance to a substrate. Painting or staining over penetrating sealers is not recommended, as it defeats the purpose of the material. With film-forming materials, if more than a stain is required, it may be desirable to use an elastomeric coating to achieve the desired watertightness and color. Penetrating sealers are used on absorptive substrates such as masonry block, brick, concrete, and porous stone. Some penetrating sealers are manufactured to react chemically with these substrates, forming a chemical bond that repels water. Penetrating sealers are not used over substrates such as wood, glazed terra cotta, previously painted surfaces, and exposed aggregate finishes. On these substrates, film-forming clear sealers are recommended (which are also used on masonry and concrete substrates). 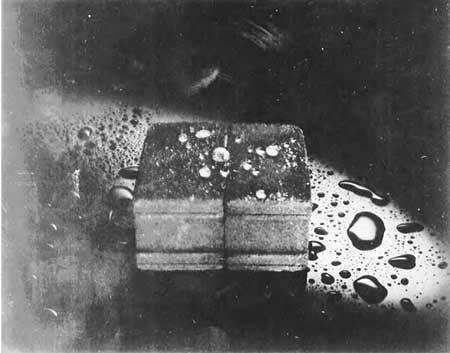 These materials form a film on the surface that acts as a water-repellent barrier. This makes a film material more susceptible to erosion due to ultraviolet weathering and abrasive wear such as foot traffic. Penetrating sealers are breathable coatings, in that they allow water vapor trapped in a substrate to escape through the coating to the exterior. Film-forming sealers’ vapor trans- mission (perm rating) characteristics are dependent on their solids content. Vapor trans- mission or perm ratings are available from manufacturers. Permeability is an especiallyimportant characteristic for masonry installed at grade line. Should an impermeable coating be applied here, moisture absorbed into masonry by capillary action from ground sources will damage the substrates, including surface spalling. Many sealers fail due to a lack of resistance to alkaline conditions found in concrete and masonry building materials. Most building substrates are high in alkalinity, which causes a high degree of failure with poor alkaline-resistant sealers. Penetrating materials usually have lower coverage rates and higher per-gallon costs than film materials. Penetrating sealers, however, require only a one-coat application versus two for film-forming materials, reducing labor costs.